All-time classic Panzer Corps and its expansions covered almost every single battle of the European theater of World War II. In 2015 there was even the chance to lead a completely fictional invasion of Great Britain with the Axis Forces in Operation Sea Lion. However, until now, no campaign devoted to the Red Army was available. 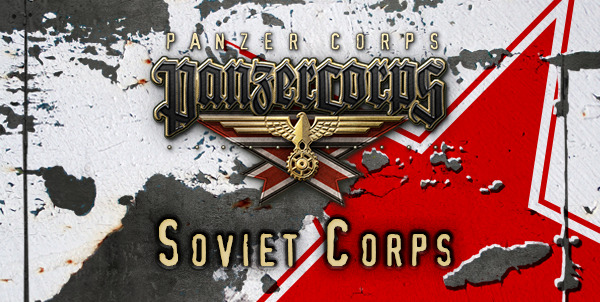 Fans of Russian history will no longer be frustrated because Soviet Corps – a stand-alone expansion of Panzer Corps – will be released on PC and iPad on February, 18! Expanding upon the successful Panzer Corps game system, Soviet Corps features 25 challenging scenarios on multiple fronts. From the Winter War in Finland to the last offensives against Japan in Manchuria, players will relive 6 exhausting years of war from the Soviet point of view. More than 60 new regular and special elite units have been added to the huge database for an unforgettable experience at the head of the Red Army! Get more information on Soviet Corps from its official product page. And don't forget to check the forums for news and updates!